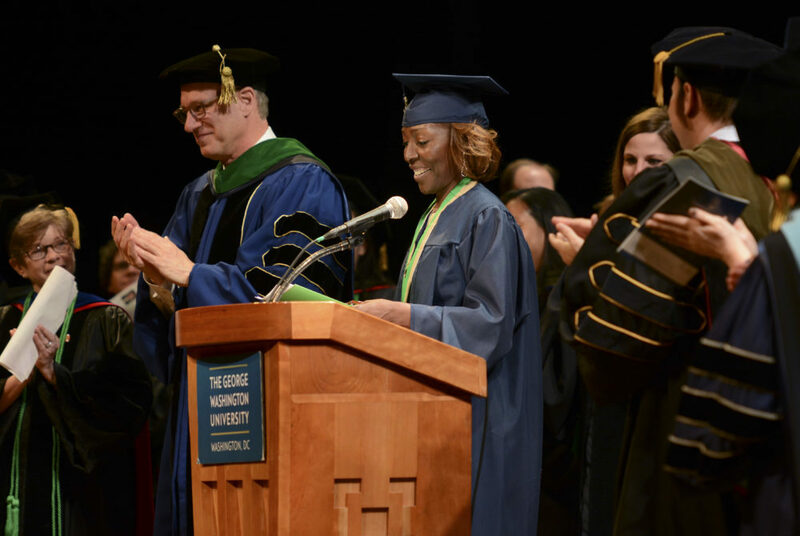 Student speaker Majorie Brown told School of Medicine and Health Sciences graduates to use their medical degrees to make a positive difference in the world at the school's commencement ceremony Saturday. The sound of bagpipes led graduates of the School of Medicine and Health Sciences into Lisner Auditorium Saturday afternoon to receive their diplomas at the school’s commencement celebration. Following a welcome from SMHS Dean Jeffrey Akman and the presentation of academic and leadership awards, the graduates recited the school’s pledge to practice medicine with integrity and compassion. Speakers at the ceremony told graduates that they should live by a set of common values, embrace cooperation and always be on the lookout for new opportunities. Akman opened the ceremony by congratulating the graduates on their hard work, passion and spirit of dedication. “These are the values in our oaths and in our lives that matter more than anything,” he told the graduates. Student speaker Majorie Brown, who graduated with a master’s degree in health sciences, recognized her mother, who was celebrating her 86th birthday Saturday, drawing applause from the audience. “We cannot allow these uncertainties to hinder our progress in the delivery of healthcare services that we will continue to provide,” she said. “Opportunity for changes can be found anywhere – from conducting research in a lab to sitting with a couple and having a conversation about healthcare in an airport,” she said. Bushardt encouraged graduates to embrace collaboration in their careers rather than try to go it alone. He said working together was the best way to bring about positive change.